AUNEOS Cares Your Phone, Cares MORE About You!!! 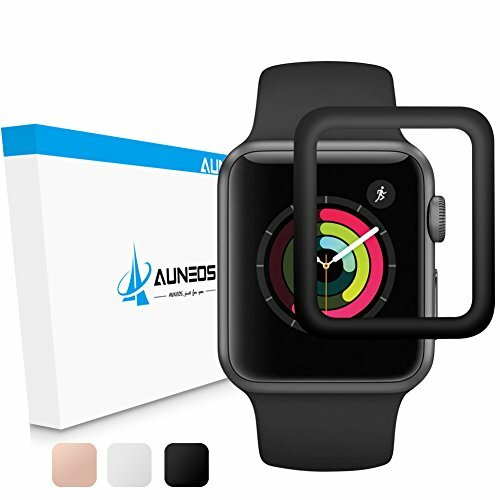 Why Choose AUNEOS Apple Watch Screen Protector? ✔ Double Protection - Tempered Glass Face + Carbon Fiber Soft Edge! ✔ Automatic Absorption Tech - Self-Adhering, Easy Application! ✔ 3D Full Cover - Polished & Rounded Edges - Max Coverage! ✔ 9H Hardness - Shatter-Proof, Anti-Scratch, Puncture-Free! ✔ Oleophobic Coating - Anti-Fingerprint, UV-Resistant, Rainbow Effect Free! ✔ 99.99% High light transmittance + High Reflectivity! ✔ Step 1: Wipe your iwatch screen with the Wet Cloth. ✔ Step 2: Clean the left alcohol with the Micro-fiber Cloth. Paste away all the dust with the Dust-absorber. ✔ Step 3: Peel the protective layer off the adhesive side. ✔ Step 4: Hold the glass by the side, carefully align the glass and the cutouts of the screen, place it onto the surface carefully. ✔ Step 5: Click on the glass from center to edge and it will automatically attach to your iwatch screen. ✔ Step 6: Use the Micro-fiber Cloth to remove tiny bubbles. Or peel it off gently and reinstall if bubbles still exist. An Exceptional Customer Experience is Our Highest Priority! √ [Newest Version for Series 3] AUNEOS is "the One" in the market that initially released the "Full Adhesive Tempered Glass" Version for Apple Watch Series 3. 100% Matched with all Round Edges of Your Apple Watch. Perfect Snug Fit! √ [2 in 1 Design] Carbon Fiber Soft Colored-Frame & 0.2mm Ultra Thin Tempered Glass Flat Surface. Flexible Colored-Edge WONT interfere any kind of Casing, also softens the effect on Bumps & Drops. √ [Edge to Edge] 3D-Curved Edges provides Maximum Protection from Side to Side, making it possible to a Full Coverage - Effectively prevent Dust OR Liquid from migrating through the film to affect the underlying dial. √ [Amazing HD & Touch] The 0.2mm Glass surface sit flush on watch without halo bubbles, leaving the Touch Responsive unaffected AND perfectly Rigid Translucency. √ [Easy Installation] The Soft Colored-Frame has NO Sticky Glue. ONLY the entire Apple Watch Flat Screen has Full Adhesive. The Flat Tempered Glass Portion will absorb Watch Screen Automatically. If you have any questions about this product by AUNEOS, contact us by completing and submitting the form below. If you are looking for a specif part number, please include it with your message.